The “Win a PC” sweepstakes is back! We are happy to announce that the NVIDIA, EVGA and MAINGEAR promotion has been relaunched, and now everyone has a chance to win a very special gaming rig. 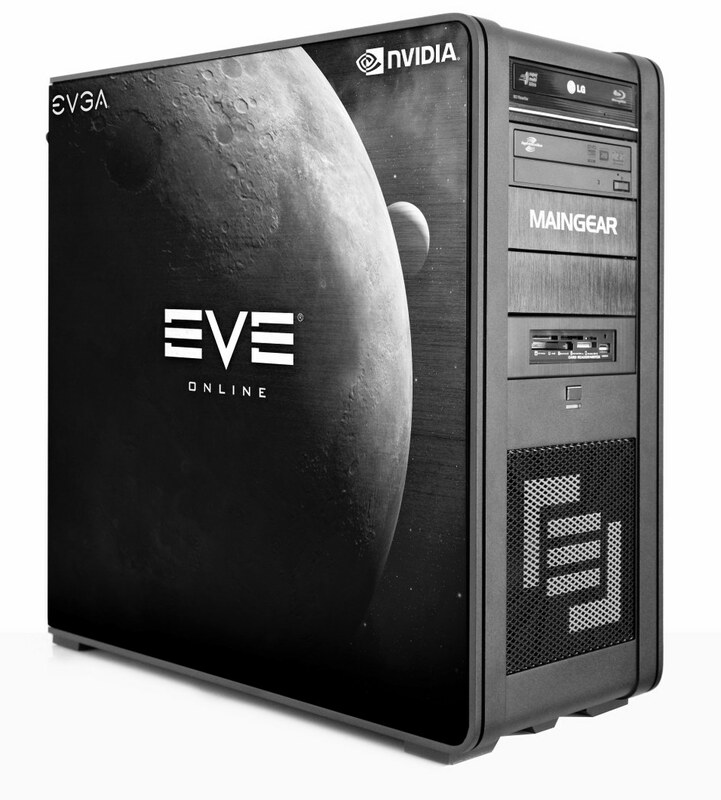 Valued at over $3,000 USD, this top-of-the-line MAINGEAR PC comes with a custom EVE Online laser etching. To apply, just visit the contest page and fill out a short questionnaire before May 8. Curious on the custom laser etching? Check out this image! - M.A.R.C. Laser Engraving: Yes, I'd like you to laser engrave my MAINGEAR. I'll supply the artwork! - Wireless Network Adapter: Integrated 802.11b/g/n Wireless - up to 300Mbps! Please see the contest page for a full set of rules. Whoa...what? So those of us who played the first time around by doing the "like" thing on FB were dupes? The point where you knew you did something wrong was when you did it on Facebook. BTW it isn't clear is this available to those of us who don't actually live in America? So check with your local laws. I know some places in Canada you can't win more then a certain amount if some conditions aren't met. Seriously CCP...seriously? Is this how you run things? It's a small thing maybe, but it's about integrity. soooo, you'd rather ccp run no contests at all, just because your country say's you cant' win a contest hosted in another country? Honestly, I have no idea what you're talking about. The issue is that CCP already ran this contest through FB, but now they're forgetting that one even happened and starting a new one? That's inane. Unless they already gave the first computer out and I missed the memo? You mean I liked Eve and Nvidia on Facebook for nothing?!?! That's it, I'm quitting Facebook and giving away all my friends! hardly worth 3,000 USD tbh. Im actually disappointed that my machine I built for 2000 USD can outperform this one any day of the week. First post says OCZ Vertex 3 SSD and Samsung F3 HDD while linked page saya Intel SSD and Western Digital Cavair Black HDD. Not really important but though I should point it out. As for performance the only thing you could really upgrade to get a noticeable performance boost is the graphic cards. Then it comes to price custom made computers like this are always more expensive then building it your self. Putting the system together at the maingear site to specs provided I came out at $2,924-3,051 depending on what exact harddrive and SSD where selected. Edit: Missed to add 2 extras raising the total about $150. It's mine, stand back or I will pod you all! Went to register on the evga site, said my email address was already registed. So I tried to reset the password, mail never arrived. Registered with a new address, again no email. No monitor ? I'd like a TX-P50VT20 to come with it.